Donald Trump Feng Shui Enthusiast. Why Donald Trump, The President of the United States of America uses feng shui? Donald Trump – Feng Shui Enthusiast? Why does Donald Trump, the President Elect of the United States of America, use feng shui? Donald Trump – Feng Shui Enthusiast. When Donald Trump becomes the President of the United States – is he going to use feng shui and space clearing practices in the White House? Why Donald Trump, President Elect of the United States of America uses feng shui? When Donald Trump becomes the 45th President of the United States – will he use feng shui and space clearing techniques to create a more harmonious White House? Once Donald Trump is President of the United States – is he going to use feng shui and practise space clearing in the White House? I hope so. I’m waiting for the call. If the White House is feng shui’ed, it will create more harmony, balance and peace and provide optimum conditions for working and living, as well as for making the best decisions for the American people and the world. President Vladimir Putin – please take note. White House Redecorated Donald Trump Style? The president-elect is well know for lavish and opulent interiors. Mhairi Coyle, an interior designer, suggested that Donald Trump might go for a Versailles look which means gold, marble and chandeliers which means gold, marble and chandeliers – which are are all good feng shui interventions as long as they’re in harmony with the deco and style of the White House and feng shui principles. However, Mr Trump has mentioned in the past that he would tone down his interior decorations if elected and said that the White House was a special place (in 2015 for People magazine) – “You don’t want to do too much touching.” and he also said that he’ll be busy working, not decorating. What would I advise Donald Trump if he would have asked me for a feng shui advice? 1) The Oval Office: I would suggested some very subtle additions to make his own stamp on the place – of course, if that would be appropriate. 3) Making it a home: home making is a very important aspect of settling down in a new environment. I would suggest to position his favourite things, art and photos in key areas so he and the whole family would feel at home there. The curtains have been changed to gold ones; the huge, circular rug from Obama’s presidency that featured quotes from leaders including, MLK Jr. and four former presidents has been replaced with the sunburst gold and yellow rug with garland edges designed by Laura Bush during her husband’s presidency, as it’s said Bush requested to have one that represents his spirit of optimism. 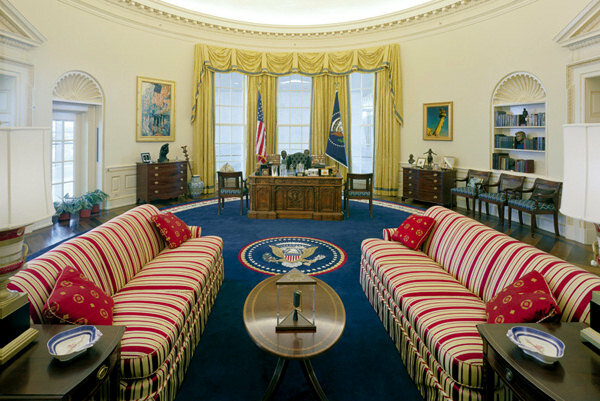 The couches inside the oval office were also replaced, so they are now brocade and no longer grey suede. Oval Office House House – feng shui’ed? Posted in Donald Trump Feng Shui Enthusiast.